As Rafael Nadal sat down in his chair at the end of the third set of Monday night’s brutal US Open final against Novak Djokovic, for a split second, he was on his way back. The Spaniard had been hustling, clawing, scraping his way through a match that Djokovic was winning by a seemingly peerless scoreline. A two-sets to love lead, with just five games dropped, that was all about depth. Nadal was short, Djokovic was deep. But in the third set, an 84-minute torture-fest that fried the already fragile nerves of tennis fans around the world, Nadal remembered who he was. Rafa. The ultimate warrior. One of the most mentally complete tennis players there has ever been. The man who terrifies opponents with a single raised eyebrow, the picture of elemental brute force. The forehands that had been struggling over the service line were suddenly fizzing through the deco turf, the slice backhand that had as much bite as a soft cheese began to push Djokovic back, and the two enused in a all-court tug of war that had the entire stadium doing serious damage to their fingernails. Breaking the skinny Serb as he served for the title, Nadal lip-curled his way back into contention, feeding off Djokovic’s aching back and suddenly worried disposition. Dominating the tie-break, Rafa managed to avoid not winning a set in a Grand Slam final for the first time. But when he bounced off his chair to begin the fourth set, something curious happened. The same thing as had happened at Wimbledon. He had absolutely nothing left. No answers. No way back. It was starkly reminscent of the way Roger Federer fell apart against Nadal in the final set of their Australian Open final in 2009. Federer had been meant to win that match. Nadal had been run through the washing machine by Fernando Verdasco in a very late five-set semi-final, so exhausted by the end that the pair practically held each other up as they hugged at the net. Instead, he could only watch helplessly as the Spaniard made a mockery of their epic rivalry, screaming through the final set 6-2. And then came the tears. Federer blubbed at the microphone as he tried to justify to himself how he had lost to this man yet again. That Nadal leads their head-to-head by 17-8 is all the proof you need that it works. Nadal took Wimbledon, he took the No 1 ranking, he took the Australian Open, and then he took the career grand slam, took them all from Federer. And now with a sense of almost poetic reciprocity, Djokovic is doing the same thing to him. At the start of this year, their head-to-head was 16-7 in Nadal’s favour. That lead has been cut to 16-13. Having never won a single one of their five meetings in a tournament final, in 2011, the Serb has won all six. Having never beaten the Spaniard on clay in nine previous matches, in 2011, Djokovic has done so twice. 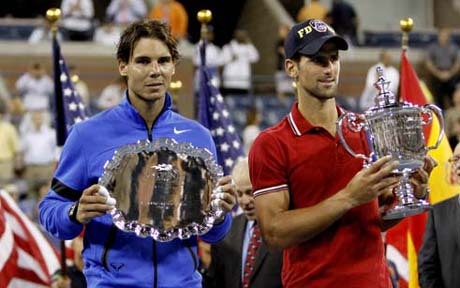 And having taken Nadal’s Wimbledon crown and the No 1 ranking, on Monday Djokovic took the US Open too. Only Nadal, a man who admits he is constantly battling against his own self-doubt,Â knows how much it has affected him. “I have to accept that I won a lot in the past,” he said, his turn to try and hold back the tears as he spoke to the Flushing Meadows crowd. But what exactly he needs to work on is at the root of his perplexion. He believes Djokovic is a better player because he makes less mistakes. Djokovic believes he is a better player simply because he believes he is. Admittedly, Nadal’s execution was not inculpable. He hit short, he served slow. But it is the tactical puzzle that seems to be weighing most heavily on his brain. Just as Nadal makes Federer boil over in his search for answers, Djokovic strings Nadal around the court as he seeks a way through. Just like Nadal uses his forehand to pummel the Federer backhand, Djokovic’s forehand shoots through the Nadal backhand. And, perhaps most tellingly, just the way Federer frames shots against Nadal he would never dream of missing against anyone else, Nadal sends his weapons long and wide when he plays Djokovic. That is where the breakthrough is needed. But if anyone can do it, Rafa can. Two days after their four hour and 10 minute battle, both players are already back on the court,Â four months of practice ahead of them between now and the next Grand Slam. That’s a lot of time for things to change. After all, it’s the time it took Djokovic to become almost invincible.